Which products can you use safely and which not? Research (UNEP report ‘Plastic in Cosmetics’, 2015, TAUW-report “Test to assess and prevent the emission of primary synthetic microparticles”) shows that many more types of plastics are added to personal care products than solely the ‘classic’ plastic microbeads: Polyethylene (PE), Polypropylene (PP), Polyethylene terephthalate (PET), Polymethyl methacrylate (PMMA) or Nylon. But there are also products that are free of any plastic ingredients. The brands and companies that do not use microplastic ingredients in their products can carry the ‘Zero Plastic Inside’ logo. The producer of the brand has publicy declared that its products are totally free of microplastic ingredients. We ask the companies and brands to sign our statement: “We as a producer declare that all of our products from the brand […] are 100% microplastic free”. In one glance, this logo makes it clear for consumers that a product is guaranteed 100% free of microplastic ingredients. 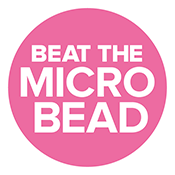 You can also have a look at the list of microplastics and check the products yourself. Check our Product Lists to see if your products contain microplastic ingredients.